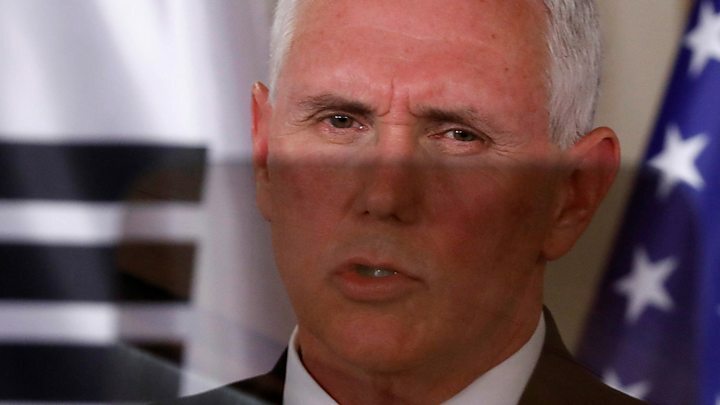 Media captionUS Vice-President Mike Pence: "North Korea would do well not to test [President Trump's] resolve"
"Just in the past two weeks, the world witnessed the strength and resolve of our new president in actions taken in Syria and Afghanistan," Mr Pence said. He reiterated US support for South Korea, telling his host: "We are with you 100%." The BBC's Stephen Evans in Seoul says US policy now seems to be to persuade China to contain North Korea while keeping the economic and military pressure on. China, historically Pyongyang's sole major ally, has reiterated its call for North Korea to stop all tests, and has also called for a peaceful solution. He added that the crisis is between the US and North Korea, noting that "China is not the initiator of the Korean peninsula nuclear issue". Besides Sunday's launch, North Korea has held a series of large-scale events in the past week including a massive celebration and military parade on Saturday. Also on Monday, North Korean leader Kim Jong Un penned a letter to Syrian President Bashar al-Assad to mark the 70th anniversary of Syria's independence, according to state news agency KCNA. "I express again a strong support and alliance to the Syrian government and its people for its work of justice, condemning the United States' recent violent invasive act against your country," he reportedly wrote. Pyongyang has denounced the US deployment of an aircraft carrier group to the region, saying it would respond by "force of arms" to "reckless moves". Mr Abe on Monday told a parliamentary session that diplomatic efforts were "important to maintain peace", but "dialogue for the sake of having dialogue is meaningless". 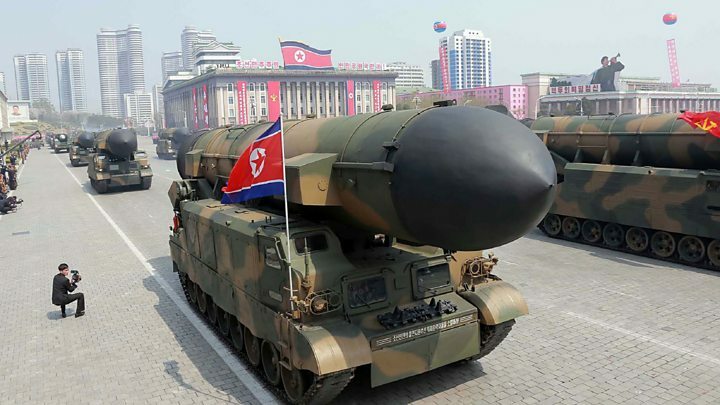 How advanced is N Korea's nuclear programme?